We’ve known the main features of Amlogic S905Y2 and S905X2 processors namely an upgrade to an Arm Mali-G31MP2 GPU with OpenGLES 3.1, and support for USB 3. since last month, and TV boxes launched earlier this month with products such as Beelink GT1 Mini or A95X Plus. But we were still missing some parameters like the manufacturing process, max CPU and GPU frequencies, and so on. 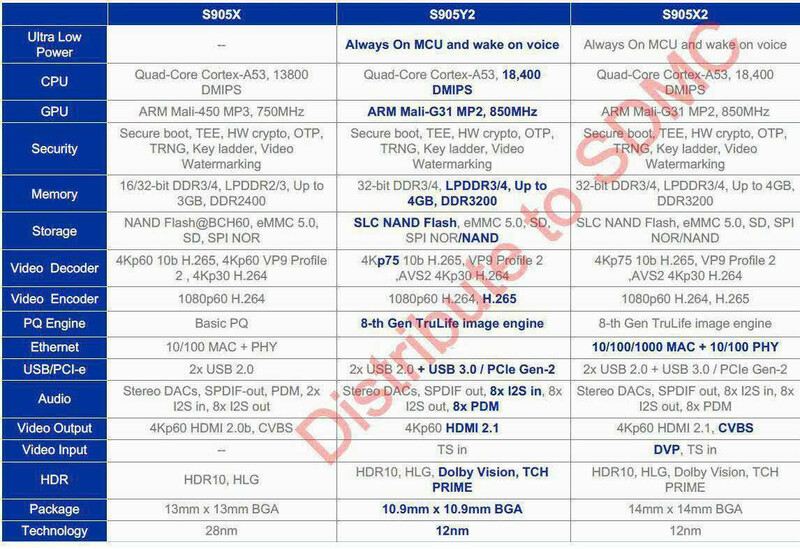 We now have all this information and some more thanks to a S905X/S905X2/S905Y2 comparison table released by SDMC a few days ago, and likely coming from Amlogic themselves. Bear in mind those are still numbers from a document, and actual testing will be require to find out whether Amlogic massaged the numbers once again. The Mali-G31 GPU is closed at up to 850 MHz, against 750 MHz with the Mali-450 GPU in S905X. The memory interface has improved as well with the new SoCs supporting LPDDR3/4 up to 3200 MHz, and up to 4GB RAM, but we already knew that part thanks to TV boxes announcement. There’s also a small change for storage interfaces with NAND SLC and SPI NAND flash now supported, but I’m not sure this is a significant change since most systems should be relying on eMMC flash. The hardware video decoder can now handle 4K videos up to 75 Hz instead of just 60 Hz (why? probably just because it can unless I missed something), and adds support for AVS2 that should mostly/only matter for the Chinese market. There’s also an enhanced video post-processing engine called “8th Gen TruLife Image Engine”. S905X supported HDR10 and HLG high-dynamic range solutions, and the new processors add Dolby Vision and TCH Prime (which I never heard of). Video output is indeed HDMI 2.1 as reported on some products page, but of course without 8K video support. S905X2 also includes a CVBS interface for composite audio. as well as a DVP camera interface, but not S905Y2, which makes sense due to the latter targeting HDMI TV sticks. For the same reason, Ethernet is gone on Amlogic S905Y2, while Amlogic S905X2 comes with both a Gigabit Ethernet MAC, and a Fast Ethernet PHY. Both new processors also add USB 3.0 and PCIe Gen-2 interfaces, as well as TS input interface for digital TV tuners. S905Y2 and S905X2 have been designed for smart voice application, and beside the wake-word MCU, they also support 8x microphone arrays via I2S and PDM interfaces. There was a somewhat heated discussion about the manufacturing process last time, and we finally know the answer: S905X2 & S905Y2 are manufactured using a 12nn process. S905Y2 has the smaller package (10.9×10.9mm BGA) of the three processors, while S905X2 is a bit bigger even compared to S905X due to the extra features with a 14x14mm BGA package. Buying an Android TV box in Canada can turn your TV into an entertainment hub full of unlimited options of movies, TV shows and music. You can do all this from the comfort of your couch accessing numerous videos, music, games and apps with convenience. Have you been wondering how to access the Canadian TV shows you love? Consider the option to buy Android TV box Canada that with the internet from your network provider can help you stream without having to hunch over your laptop instead of view from the couch using a wireless mouse and remote control. With more than thirty Canadian TV networks streaming their TV shows online, it is possible for you to gain access using streaming services as Kodi. Kodi is used to access media content from internet streams and local Canadian networks through various add-ons. There are many add-ons tailored to Canadian Kodi users that you only need to keep updated. To access the Canadian content you love among content from other streaming sources, go to any reputable seller in Canada and get yourself an Android TV box that either comes with Kodi already pre-installed or requires you to install and set it up yourself. Buy Android TV Box Kodi: Have you been looking for a service to help you stream content to your TV? Kodi, previously known as XBMC is the best software for your Android TV box to give you a wide range of streaming services that make it easy to stream and play video and music over local networks or Wi-Fi. Apart from its streaming and media player capabilities, Kodi also enables you to install plug-ins to be able to stream from services such as YouTube, Spotify and Amazon Prime Instant Video. To use Kodi on an Android TV box, you can choose to buy a box that has the service already pre-installed or buy a TV box and install Kodi on it by yourself. While TV boxes such as the $300 NVIDIA Shield box may be off the charts in terms of performance, if it is not within your budget, you can opt for a cheaper box that has decent performance even if that means that you have to forgo some of the components. Picture a smartphone stuck in a certain Android version that you not only cannot update but don’t have the money to get a new one with a later version. This can make you lose out on the various apps and functions that are only supported by later versions. In the same way, a Kodi box without regular firmware updates will become outdated quite fast and cost you more in the long run. When out to buy Android box Kodi, choosing one that offers over the air updates as opposed to manual updates is sure to be less tedious when it comes to updating firmware. A good Kodi box will have after sale support offered by the manufacturer, as well as resources on the manufacturer’s forum that form a great support network. Best Android TV Box Channels: So you have bought your Android TV box, installed Kodi, now what? Since Kodi is basically a streaming service from the internet, you are probably wondering if you can access live TV and if so which channels are the best when using the streaming service on an Android TV box. This acts as an appstore for Kodi allowing you to install the best Kodi add-ons without having to really search for them. Arguably the best add-on, developed by Lambda, it eases the process of streaming shows and series and playing movies from your Android TV box. It is quite reliable and offers a simple interface with advanced features. It can be installed using the add-on installer. Of vital importance when using Kodi is VPN. The VPN Manager add-on helps you connect easily and automatically to VPN providers and hence makes it easier and more convenient to use the internet to stream your shows. This add-on is great especially because it allows you to access channels from various supported countries and get access to sports and TV shows and series. With its sleek design, easy to navigate features and link collection that give you access to a huge database of movies, live sports, TV shows, kids’ stuff, music, international TV and documentaries, the add-on has been around for years and is still a worthy addition to your list of add-ons. If you are a diehard fan of music, you will indeed appreciate the valuable Music Box add-on. Developed by Techdealer, it has a huge quantity of music files both current and old and is hence a great addition for your Kodi. Do you want to make your kids cartoony dreams come true? This add-on is valuable if you are looking to access all types of cartoons and it even has a search button to guide you in unearthing the cartoon show that your kids have been looking for. Besides, you can also take a nostalgic trip down the memory lane and watch the few that you miss from way back when! Android tv box reviews and rating: An Android TV box, also known as a Streaming box or a Kodi box is a TV box that enables you to stream via the media center Kodi, streaming apps and add-ons. With an Android TV box, you are not limited to offline content and once hooked into your TV it can allow you to access great stuff with different types of formats all from the comfort of your couch. One of the most popular TV boxes, the Matricom G-Box has a great processing speed. With the rolling out of the Octo-core, the speed is set to make searching through Kodi a breeze and hence this TV box is worth its price and achieves a cool rating of 8. A great box to purchase if you want a lower price of about $69, the Xiami Mi box is a great choice incorporating 4K HDR streaming and video playback, access to Google Play and with great gaming as well as connectivity options. It, however, misses some streaming services and apps. Rating: 7. If you are interested in gaming then this TV box is the best. With a powerful processor, micro SD expandability, great graphics, game controller design, a wide selection of native and streaming selection of games, it has a Tegra X1 CPU, 3GB RAM and 256-core graphic processor allows you to gain more in terms of power and storage. It is however, a bit on the pricey side. Rating: 9. If you have an Amazon Prime account, this box is perfect for your needs. With a 4K Ultra HD video display, streaming in 1080p, 2GB RAM, 8GB ROM and micro SD expandability of up to 200GB. It is also relatively inexpensive and easy to integrate with other services. However, its shadow updates can interfere with the smooth operation of apps such as Kodi. Rating: 8.